This consists of a horizontal agitator, which disperses the feed while it comes in contact with the hot air and gets dried. This consists of a vertical pin type rotary and stationary cages. The wet feed is fed at the center of the rotating cage, where it comes in contact with hot air. The rotating cage disperses the feed while drying. Due to very low residence time in the range of 0.5 to 2 seconds in the flash dryers, heat sensitive products can be easily dried without degradation. Particle size of the final product can be controlled by installing a particle size controller which recycles the larger particle size back to the agitator and allows only the pre-determined size particles to be discharged as product. Capacity: We can offer the flash dryers having capacities of 10kg/hr to 5000kg/hr product rate. 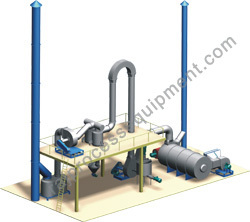 Typical applications of flash dryer are starch, bagasse, minerals, pigments and dyes, phosphates, etc.